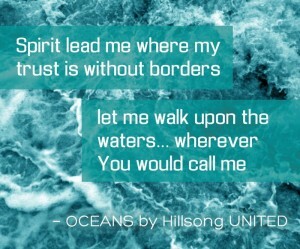 I heard a new song last week while at the Vineyard Big Sky Regional Conference in Dillon, Montana, that really connected to my heart. (A HUGE shout out, BTW, to Zane and Cathleen Springer and the Vineyard Church in Dillon!! You guys were the BEST hosts!). For those who have heard the song (and if you have not, please watch the video below), you know that the main focus of the song is passionately allowing Jesus to lead you out into the “great unknown” – to places were our “feet may fail and fear surrounds” us – i.e. it is a song about following the Wild Goose into unknown and untested waters. As you can guess, that heart and theme resonated with both Emily and me as we have told the Lord to send us wherever He wants to send us and use us however He wants to use us. We are committed to following Him to the place where our “trust is without borders” – to that place where we have no choice but to trust Him.